I was back by the banks of the River Slaney in Co Wexford this weekend for the institution of the Revd Nicola Halford as the new Rector of Enniscorthy on Friday night [22 January 2016]. Nicola’s first ecumenical engagement is this evening [24 January 2016] when she preaches at the service marking the Week of Prayer for Christian Unity in Saint Aidan’s Cathedral, Enniscorthy. 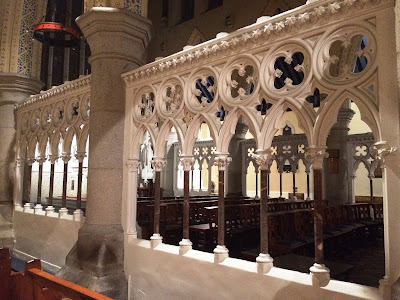 Before dinner in Alba on Abbey Quay last night, two of us returned to the Pugin trail in the late evening and visited Saint Aidan’s Cathedral, which was designed by Augustus Welby Pugin (1812-1852). The cathedral is the largest building in Ireland designed by Pugin, who based his design on the ruins of Tintern Abbey in Wales. Saint Aidan’s is a three-quarter size replica of Tintern, as Saint Mary’s Cathedral, Killarney, is a three-quarter siz scale model of Salisbury Cathedral. The first, thatched cathedral was built in Enniscorthy in 1809 on land donated by the Earl of Portsmouth, and the town became the episcopal centre of the Roman Catholic Diocese of Ferns. In 1838, Bishop James Keating (1783-1849) chaired a meeting that decided to enlarge, improve and repair the church, but Keating would have nothing to do with temporary repairs and wanted a new cathedral. Pugin was commissioned to carry out temporary repairs to the dilapidated cathedral and to draw up plans for a new cathedral. At the time, he was still only a young man of 27. 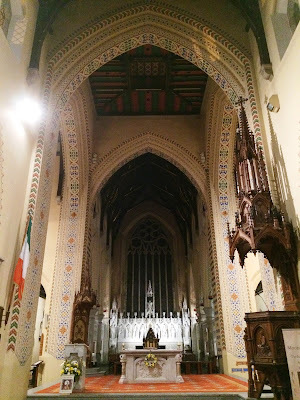 Although his response was full of alacrity and enthusiasm, no-one could have envisioned the architectural and liturgical legacy that would be bequeathed to the diocese, to the Church, and to Irish heritage. For liturgical reasons, Pugin wanted all his churches to face East, but he was forced by necessity to accept that Saint Aidan’s would face north/south because of the challenges posed by steep slope on the east side. The old thatched church had to remain intact for use inside the new building until it was completed, and so Pugin’s neo-Gothic building was built around the older church. Wexford’s own architect of the Gothic school, Richard Pierce, was Pugin’s clerk of works during the building of Saint Aidan’s Cathedral, which was carried out in two major phases: the eastern parts were built between June 1843 and June 1846, and the nave and aisles were built between 1846 and 1848. As the building work began, it is said that Dr Keating went through the streets of Enniscorthy during fair days, enlisting the support of local tradesmen and farmers, who contributed to materially to the work of the cathedral, by drawing stones from the ruined friary by horse and cart. The debris that had fallen from the former Franciscan friary was picked, stone-by-stone, and carted away to be built into Pugin’s magnificent edifice. The foundation stone of the cathedral was laid in July 1843 and Mass was said for the first time inside the partially completed cathedral in 1846. Work was interrupted for a time in 1848 following the Great Famine and due to the illness of Bishop James Keating, who died in September 1849. By then, work on the nave had been completed, and the old building around which the new cathedral was built was demolished. In 1850, Bishop Myles Murphy was the first Bishop of Ferns to be consecrated in the new cathedral and the central designed by Pugin was completed in 1850. The friction between bishop and architect continued until Pugin died at the age of 40 in 1852, insane and without ever knowing that his cathedral would be completed with splendour. 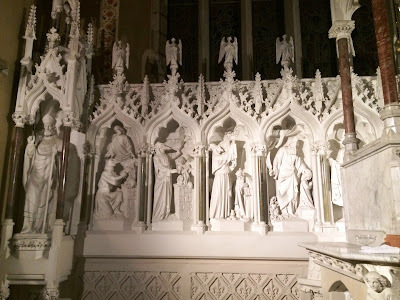 In 1857, Murphy’s successor Bishop Thomas Furlong engaged James Joseph McCarthy (1817-1882), who claimed Pugin’s mantle, to complete the interior, following Pugin’s plans, including the high altar, reredos, chancel screen and sanctuary decorations. 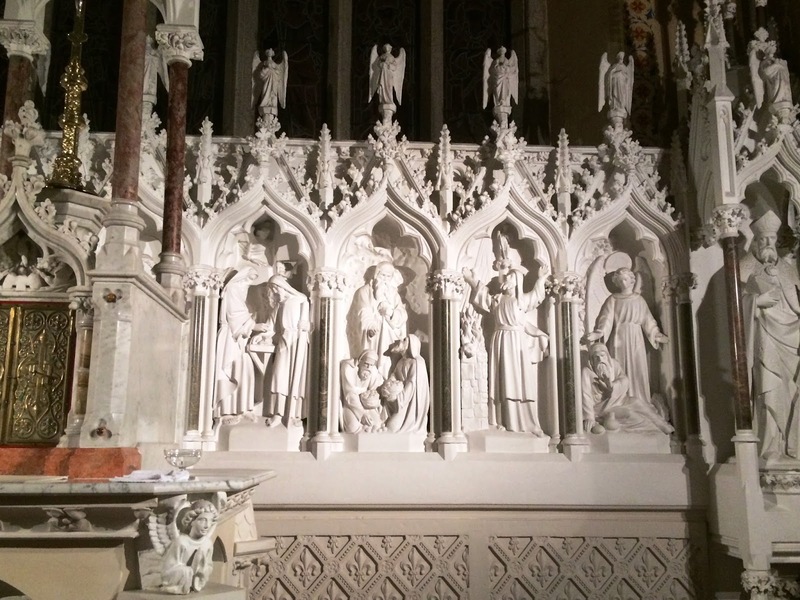 The High Altar was the work of Edmund Sharpe (1853-1930) and James Pearse (1839-1900), the father of Padraig Pearse, one of the 1916 leaders. The chancel and the sanctuary were now complete with a beautiful reredos and the great east window was filled with stained glass. 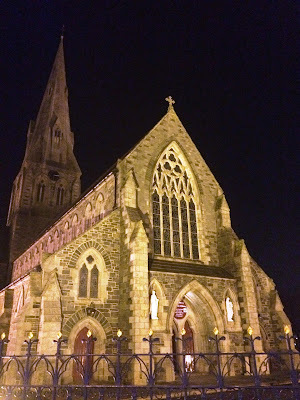 The cathedral was blessed by Bishop Thomas Furlong in 1860, but because it was not yet completed, it was still in debt, and the cathedral site was not owned by the church, Saint Aidan’s was not consecrated. Saint Aidan’s Cathedral was solemnly dedicated by Bishop Furlong on 29 June 1863. The preacher at the Pontifical High Mass that day was the Bishop of Birmingham, Dr William Ullathorne (1806-1889). 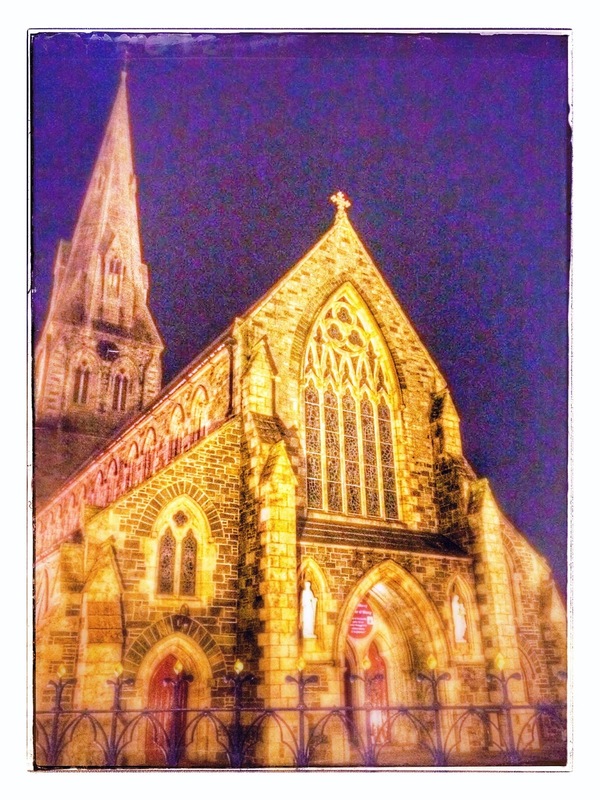 At the restoration of the Roman Catholic hierarchy in England, Ullathorne became the first Bishop of Birmingham, where Saint Chad’s Cathedral was built by Pugin. On Saint Giles’ Day, 1 September 1846, Bishop Ullathorne had presided at the consecration of Saint Giles’ Church, Cheadle, Pugin’s great architectural masterpiece in Staffordshire. Then in December 1852 he presided at the Funeral Mass for Pugin’s patron, the Earl of Shrewsbury, in Saint George’s Cathedral, Southwark. The building of the spire at Saint Aidan’s Cathedral did not start until 1871, but before long it was discovered that the tower could not support the weight and the almost completed spire had to be taken down and the height of the tower modified. The spire was completed in 1873 under the supervision of JJ McCarthy, who retained the Pugin-defined profile, and Father John Furlong, Administrator of the cathedral parish, placed the cross in position on the rebuilt steeple. In 1897, the Earl of Portsmouth, who owned much of the ground rents of Enniscorthy, including the site of the cathedral and the site of the former Franciscan friary, made a free gift of the cathedral grounds to the Bishop of Ferns. The morgue and the baptistery were added to the original plan in 1915, designed by Joseph Kelly Freeman. The cathedral was re-roofed from 1936, and the building was not completely free from debt until 1945. On 29 June 1946, exactly a century after the first Mass was celebrated in the cathedral, Saint Aidan’s was solemnly consecrated by Bishop James Staunton. Saint Aidan’s Cathedral is built in dressed local stone, with carved granite accents. The stone was salvaged from the ruins of the nearby Franciscan Friary, in 1843-1847, after the tower collapsed in 1839. Pugin once wrote: “Large stone destroys proportion. Small stone adds to the effect of a building by increasing its apparent scale.” The beautiful grey/green Ordovician rock collected from the tower of the old friary provides a perfect foil for the granite dressings. The central tower – which was rebuilt to half its intended height because of subsiding foundations – is surmounted by a magnificent broach spire, which is octagonal in shape on a square base. At the time, scaffolding work was crude, and to avoid excessive, dangerous work at a high level, the spire was built in small sections on the ground, the stones were numbered for accurate re-assembly, and they were taken by hand to roof level, where they were rebuilt without difficulty. Pugin perfected the stepped and tapered buttress as an architectural feature. They are visually powerful, symbolising strength, permanence and stability. The roof pitches are varied to add variety and balance to the outline of the building. All the roof ridges terminate in granite crosses. The cathedral’s notable features include the façade, a reredos carved from Caen stone and a great ‘east’ window with intricate stone tracery. Saint Aidan’s has scissors roof trusses, granite columns, a lavishly stencilled interior and many of the original encaustic tiles. 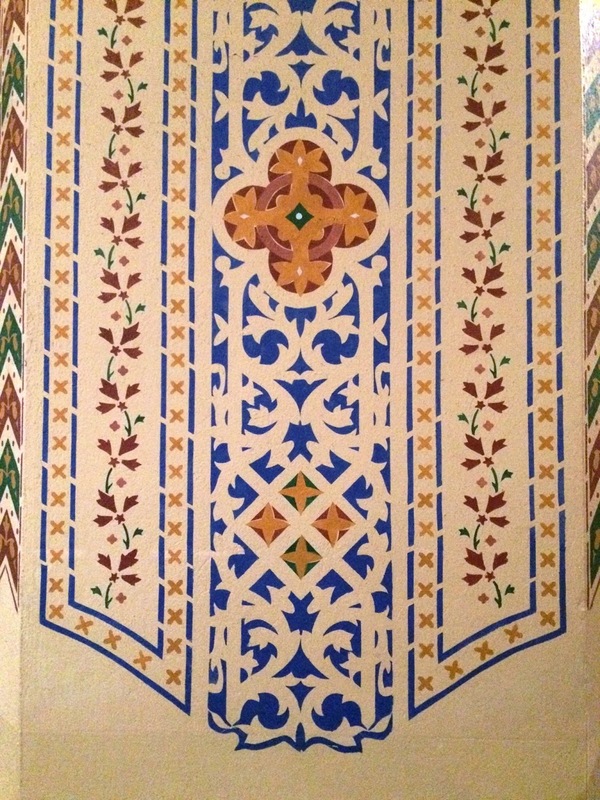 The stencilling on the arches is an exact reproduction of Pugin’s original design, in his trademark strong colours. 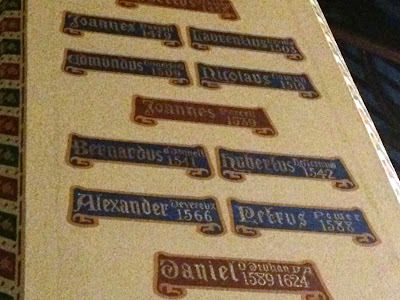 The names of the Bishops of Ferns, from Saint Aidan in 632 to the present day, including Bishop Edmund Comerford, are inscribed in gilt on scrolls on the pillars of the towers. The list was compiled by Dr William Grattan Flood, diocesan historian and organist of the cathedral of the diocese, who died in 1928, and the work is redolent of the Pre-Raphaelite and Arts and Crafts Movements. 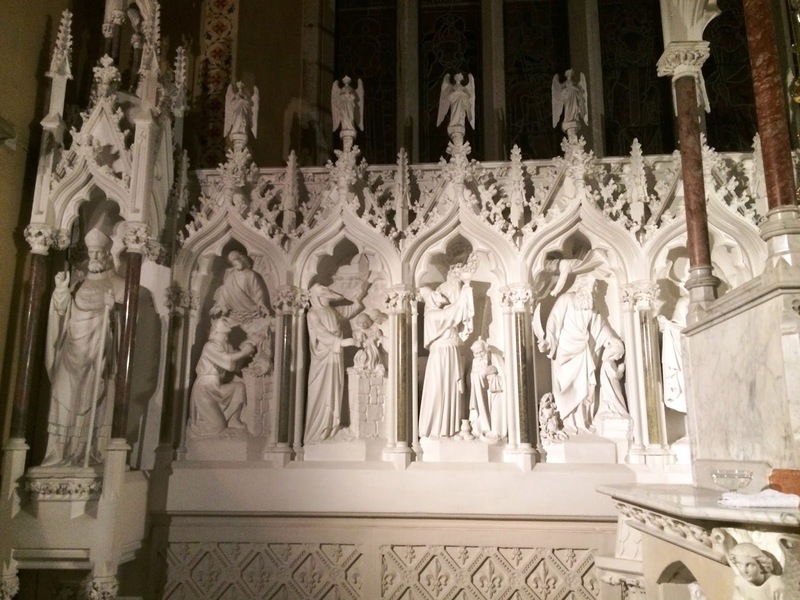 The main altar was designed by Edmund Sharpe (1853-1930) and James Pearse (1839-1900), the father of Padraig Pearse, the 1916 leader. It is surrounded by a hand-woven carpet with Pugin motifs, and is set on a praedella of Wicklow granite. Overhead, the ceilings are hand-painted also in Pugin colours. 9, Elias being fed by an angel in desert (1 Kings 19). 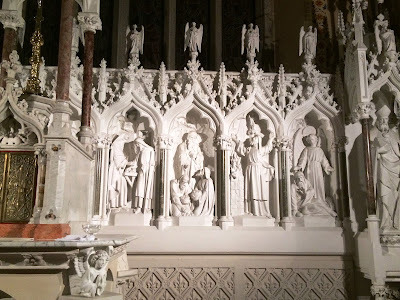 On each side, the reredos is flanked by statues of Saint Patrick, the patron saint of Ireland, and Saint Aidan, the patron saint of the cathedral and of the Diocese of Ferns. Over the reredos, the Great ‘East’ Window, with its beautiful stone tracery enclosing seven lights, is filled with twenty-eight named figures, including the Virgin Mary, Saint Joseph, the Archangel Michael, and saints. In front of both side altars are two squares of flooring covered with examples of the intricately patterned and richly coloured handmade encaustic or inlaid tiles made by Minton exclusively for Pugin. Pugin sourced the carved oak pulpit in Belgium in the 1840s, and the vertical bishop’s throne is reminiscent of Sir Giles Gilbert Scott’s Albert Memorial in Hyde Park, London, with its elaborately Gothic canopy. In the ‘north’ transept, the baptismal font stands on a base of the original Minton tiles. The pipe organ in the gallery at the ‘west’ end was built by White and Son, Dublin. Following the liturgical reforms introduced after Vatican II, the cathedral was renovated extensively. During those alterations, the magnificently carved oak pulpit and the episcopal chair were removed, and in 1970 all the Pugin-designed stencilling was over-painted with white in the style of the day. Saint Aidan’s was restored to its near original design in 1994 at a cost of £1 million. During that work, the cathedral services were held at Saint Mary’s Church, the Church of Ireland parish church where Nicola was instituted last night. 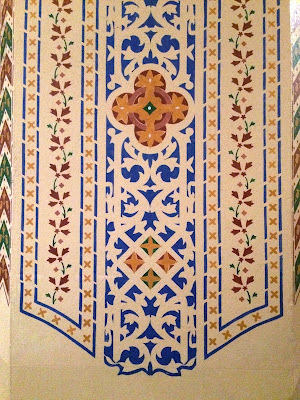 During the restoration work, which lasted for a year, authentic colours, materials and techniques were used. Bishop Brendan Comiskey re-dedicated the restored cathedral on 14 December 1994. Saint Aidan’s is now an outstanding example of the many structural and decorative characteristics of Pugin, the greatest exponent of the Gothic Revival in church architecture, and the best known of the buildings he designed in Ireland. Saint Aidan, who died in 632, is the patron saint of the Diocese of Ferns. His feast day is next Saturday, 30 January.